Every time we have sign-ups for baptisms, we get a lot of questions about how to know if a person is ready to be baptized. Since there are a lot of differing opinions on what baptism is and when a person should be baptized, we thought we’d try clear the water (pun intended) and simplify things a bit. This question is actually very different from “did you grow up in church?” or “are you a morally upright person?” The question is, do you have a relationship with Jesus that includes a knowledge of your sin, a remorse over your sin that leads you to trust in Jesus for forgiveness, and a desire to see his will as being the most important thing in your life. If these things are true of you, you're probably ready to be baptized. But if you’re not already a Christian, being baptized will not magically turn you into one. 2. Have you been baptized since becoming a Christian? The pattern in the Bible is that a person is baptized after becoming a Christian. So if you are a Christian but haven’t been baptized since becoming one, we encourage you to participate in baptism. If you were baptized earlier in life, but it was before you had a genuine relationship with Jesus, we also encourage you to be baptized now that you have become a Christian. If you have been baptized since becoming a Christian, there is no need to be baptized again. If you have considered the above questions, and want to be baptized at our next Baptism Gathering, you can sign up here. If you have any other questions about baptism or becoming a Christian, feel free to contact us. Kent Bateman, the author of this post, serves as one of our pastors overseeing our communications department. Find out more about our leadership on our Leadership page. I was a mess in college. I showed up for my four-year degree in Columbia completely convinced that this was my time to let loose. I had grown up in a small religious southern town. So while I would’ve said I was a Christian, I didn’t understand the gospel and certainly didn’t see how getting drunk and partying all the time were at odds with Jesus–it was just what people did in college, right? But God had a different idea. Two years into my college career, I somehow ended up at a Midtown Baptism Gathering. My first thought was this isn’t the type of church I’m used to. The Baptism Gathering was being held at the Coop–a building near the stadium used for tailgating. So the smell in the air was a distinct mix of beer and popcorn, and the floor was so sticky that your shoes stuck to it. I made small talk with a few people on my way in, and then the Gathering started. I remember being weirded out by the music, specifically by the guy with huge gauges in his ears playing a huge kick drum in the band (who now is my good friend Mikey). Once the music ended, everyone turned their attention to the video screen, where we heard stories of everyday normal people who had been rescued by Jesus out of sin and into freedom. Some people had been around church for a long time, and some people had never heard the name of Jesus before they started coming around our church family, but everyone’s story included them acknowledging that Jesus was better than anything else they had attempted to build their life around. It was while hearing these stories that something crazy started happening in me. As I listened to each person in the videos tell their story, almost all of them had something in common: they sounded exactly like mine. There were so many people in those videos that had grown up rejecting Christianity because the Christianity they had seen wasn’t really Christianity at all. It was religion, legalism, emotionalism–really anything at all other than the gospel. But all of them had found something now that resembled more what Jesus taught: a love for him that expressed itself in a love for each other and a love for their neighbor. That night before I left the Baptism Gathering, I made sure to stop by the Connect Table and sign up for a LifeGroup–I had to find out more about these people and what made them so different. And sometime over the next six months of experiencing Jesus through a LifeGroup, I gave my life to Jesus. Now, I get to serve as a pastor of the church family that first showed me the gospel. I get to spend every day loving, caring, and shepherding the people that played such a huge part in loving, caring and shepherding me. And the plan is for me to help lead a church plant in a brand new city soon, so that many more people can experience what I got to experience. 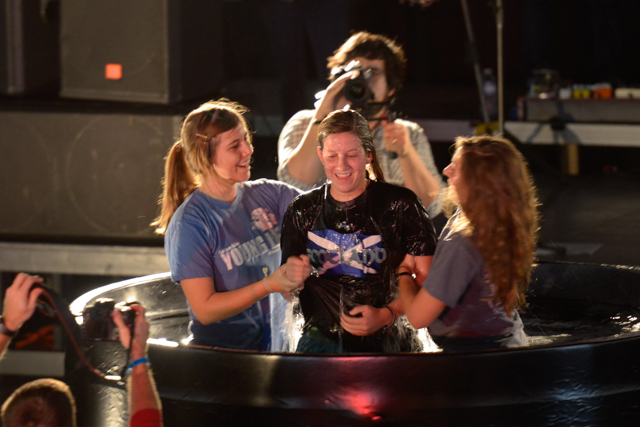 I am forever thankful to the people who shared their stories and got in that cold water to be baptized at the Coop. God used them and their stories in an incredible way to draw me to himself, and teach me how incredibly gracious and persistent he is. It’s amazing what God can do with your story. Have you met Jesus recently and want to be baptized? 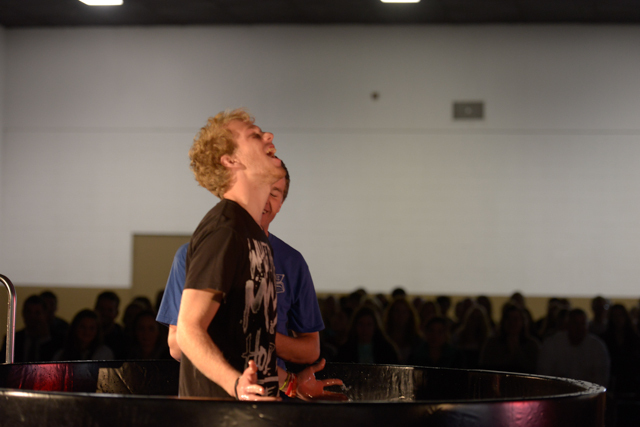 Find out more about baptism and get signed up here. With our Baptism Party coming up on November 17, we asked each of our pastors what they were most excited about. I'm so pumped for this fall's Baptism Party! This year we're trying something a little different and I think it's going to be an amazing time of hearing stories of Jesus's grace, celebrating through song/laughter/dance/food/clapping, and in the end worshipping King Jesus for all He is! Our goal for this gathering is to join together as one family proclaiming that we are - reconciled to Christ, reconciled to each other, and forever His by His blood! Hope you will join us for this celebration! I am stoked about the upcoming Baptism gathering on November 17, because I get to sing, shout and celebrate with my church family. We get rowdy and I love it. We scream, shout and clap every time someone comes up out of the water because it’s a beautiful picture of the Gospel. 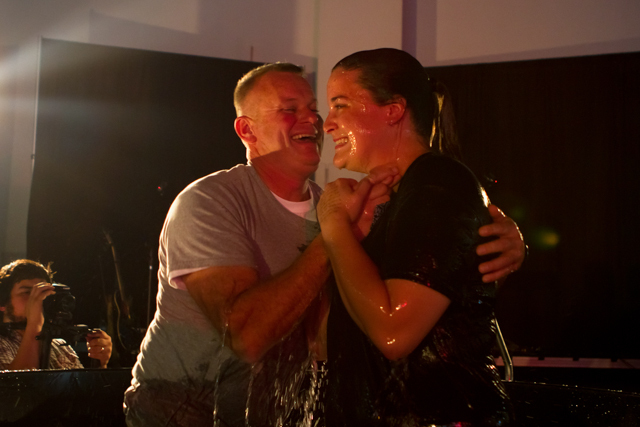 Baptism is a visual picture of the stories each person is telling; how they were dead in their sins and are now raised with Christ; how they were rescued by Jesus and are now being transformed into His likeness. It’s beautiful. This Baptism Gathering has the potential to be even better than most because the celebration concludes with a breakfast feast. 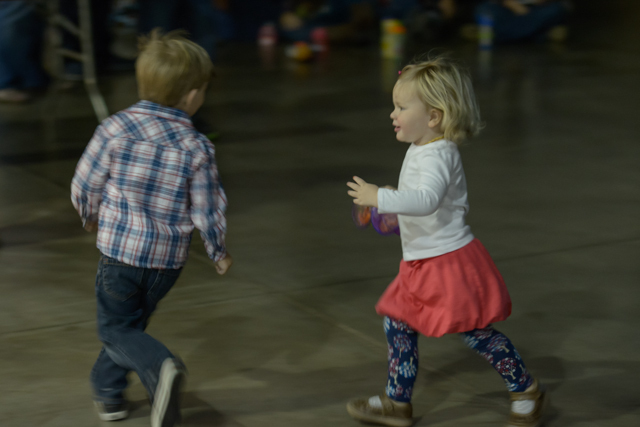 The 10 a.m. gathering will be followed by Brunch and the 6 p.m. will be followed by Brinner. I am already thanking Jesus for an awesome day of feasting and celebrating His goodness. I love the few times a year that we get together as a big family to party. I love the excitement. I love celebrating Jesus’ grace and proclaiming the gospel. I love eating and feasting and joy. It’s a little bit of heaven practice. Specifically this year I’m pretty stoked about eating breakfast all day long. The only thing better than eating breakfast at breakfast time is eating it at lunch time and calling it brunch. The only thing better than brunch is eating breakfast again for dinner and calling it brinner. No offense to the other meals of the day, but they are far inferior to breakfast. And I’m not talking about your fancy, frou-frou brunch with tea at the country club. I’m talking about bacon. And sausage. And cinnamon rolls. And casserole. And more bacon. And syrup all over all of it. Can life get any better? I submit that it cannot. Then again… eating breakfast all day with your church family while celebrating Jesus giving people the good life. I stand corrected. Life can get better. One of my favorite things about Baptism Gathering is hearing how the gospel sets all different types of people free from sin and rescues them into God's family. God started the process of saving me through a Baptism Gathering, so I'm excited every year to get to see and celebrate the stories of more people he's done that for. As our church family has grown over the years, the times where we can be together at once have gotten fewer and fewer. With something like 900 people in LifeGroups right now, there just aren't many opportunities to be in the same place at once...especially when our Devine Street building only holds about 290. This all makes me really look forward to the chances we have to get some time with all of us in the same place, such as the Baptism Party coming up. I love hearing Jesus stories. I love getting to welcome new folks and let them hear what Jesus has done in people's lives. I am so excited to for a chance to sing, celebrate, enjoy God's work among us, and eat bacon with my (church) family. Every week at the Gathering we preach the gospel from stage. A pastor gets up and expounds on how Jesus is good news for us and what it means to follow Him in everyday life. One of my favorite things about baptism gatherings is that it is our people do the preaching through their stories. Seeing people open up and transparently share how Jesus has done for them what they could not do for themselves never grows old. 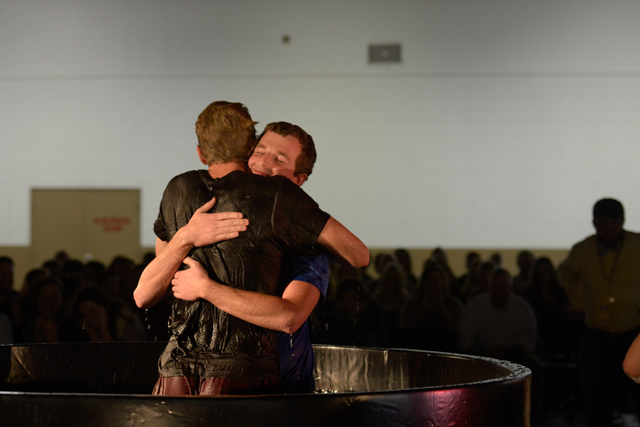 The excitement, the screams and applause for those being baptized, a symbol that Christ has raised them to spiritual life--it all gives me chill bumps. Baptism is telling the truth about us and about Jesus, and that truth makes Him look really good. I'm pumped for the Baptism Party because each one is like that rest stop with a cool overlook when you're driving through the mountains. You park your car, get out, and look at the magnificent view of the land you've just driven through. For me, the Baptism Party is a chance to pause and appreciate the magnificence of where God has brought us over this past season. It's chance for me to sit back and soak in the great view his faithfulness to seek and save us. 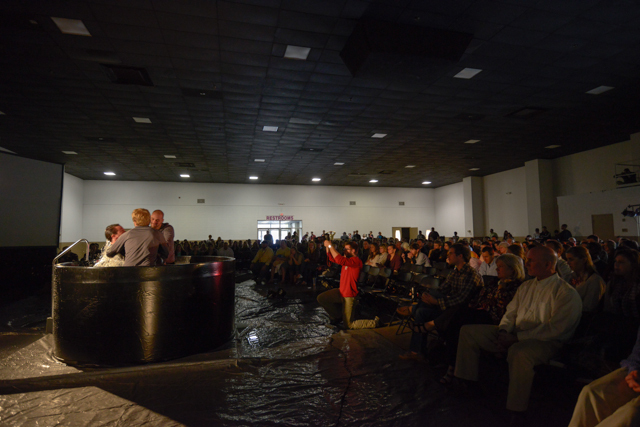 This past Sunday we hosted our Baptism Gathering at the Fairgrounds. 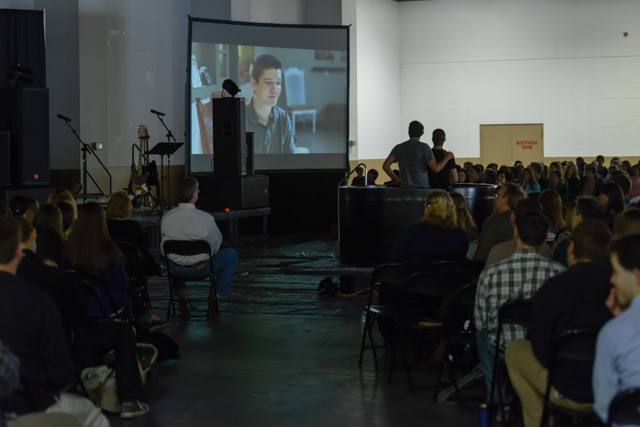 We had hundreds of people from our church family come and celebrate what Jesus has done in the lives of 19 people. Here are a few photos from the event.